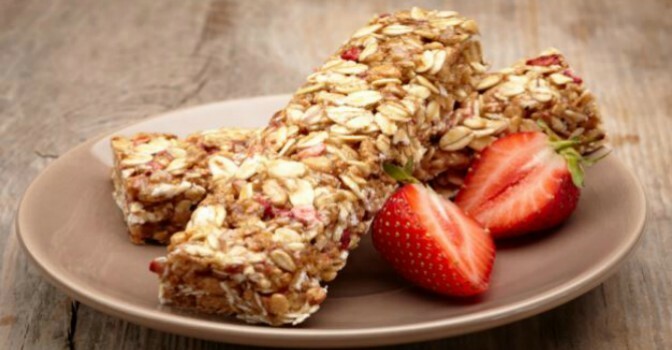 A nutritious energy bar is a healthy alternative to a meal before or after a workout. The best energy bars have a high concentration of carbohydrates to fuel your workout. Most high energy bars contain about 65 % carbohydrates, 25% protein and 10% or less fat. The great thing about healthy low-fat energy bars is that they allow you to workout right after eating one, whereas it is next to impossible to workout shortly after eating a meal. Someone who wakes up early to exercise and go to work doesn’t have time to eat breakfast and wait before working out. Energy bars play a pivotal role in your training regimen because it’s not practical to eat a meal and exercise immediately afterwards. There are several things to look at when choosing a healthy energy bar. First of all, watch out for a high sugar content. Some energy bars have more sugar than chocolate bars. The Chocolate Chip Clif Bar has 23 grams of sugar – almost 6 teaspoons of refined sugar! And energy bars made with sugar alcohols – maltitol, xylitol, sorbitol – cause bloating and gases. Palm kernel and palm oil – both high in saturated fat – are two ingredients found in many chocolate or yogurt coated energy bars. The Atkins Advantage S’mores bar has 9 grams of saturated fat, and adults are advised not to consume more than 20 grams of saturated fat a day. Of course there are healthy energy bars out there, whose ingredients are not identical to those found in chocolate bars. Look for energy bars that are made with natural ingredients: fruits, vegetables, nuts, seeds and sprouted grains. These are usually naturally sweetened with real fruit, instead of refined sugar and syrups. Fibre is also an important ingredient to have in a nutritious energy bar because fibre helps keep you full longer. Always read energy bars’ list of ingredients to find one made with dried fruits, vegetables, nuts, seeds and whole grains. Nuts and seeds are healthy sources of fat and protein, helping check your appetite and fuel your energy. Avoid artificial sweeteners and preservatives, and keep track of refined sugars and syrups. Look for a low sugar energy bar that offers a minimum of 4 grams of fibre and less than 3 grams of saturated fat. Healthy energy bars should include both protein and carbohydrates – at least 6 grams of protein and at most 40 grams of carbohydrates. Carbohydrates provide the energy to fuel your workout and protein repairs your muscles afterwards. And while even the best energy bars cannot replace a nutritious meal, they are a healthy high energy snack! Healthy high-energy bars have their place in our workouts.